Saving highsec isn't just my responsibility; it's my pleasure. I love helping others, and I love hearing about others helping others. 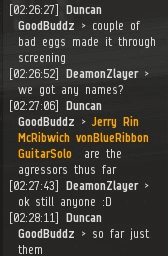 I knew I was in for a treat when I received a communiqué from Agent Fighter Jets GuitarSolo. Fighter and the New Order Spai Agency implemented a new audit procedure to help ensure the Code compliance of highsec industrial corporations. The audit involves sending Agents into the very midst of the corp to see firsthand whether the Code is being obeyed. A corp may exempt itself from the audit procedure by paying a yearly fee of 1 billion isk. Now, before the rebels and skeptics start their usual squawking, no, this is not a change to the Code. 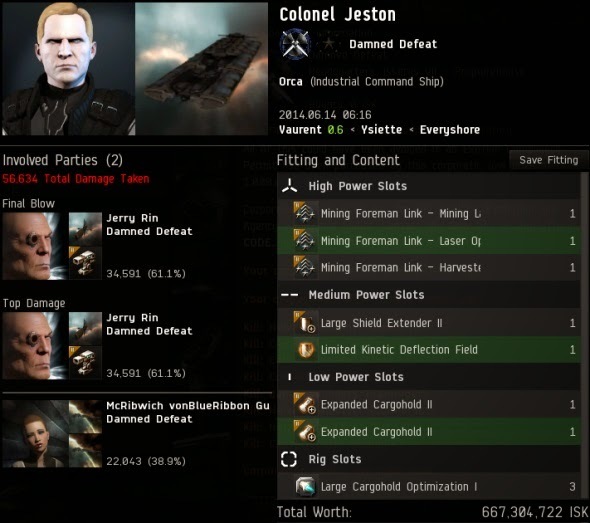 Mining permits cost 10 million isk and always have. No one is required to purchase an ECCP. Corporations whose members follow the Code have nothing to fear from an audit. The ECCP merely exists as a safe harbor for corps that wish to be exempt from that particular form of audit. This policy lessens the burden on the industrialists. Now watch the rascally rebels spin this as a bad thing, just like they did with the New Order bathroom protocol! This isn't some kind of allegory; the corp targeted for an audit really was called Damned Defeat. Founded by carebear criminal JTClone Ares, Damned Defeat was open for less than a week before our Agents infiltrated it. 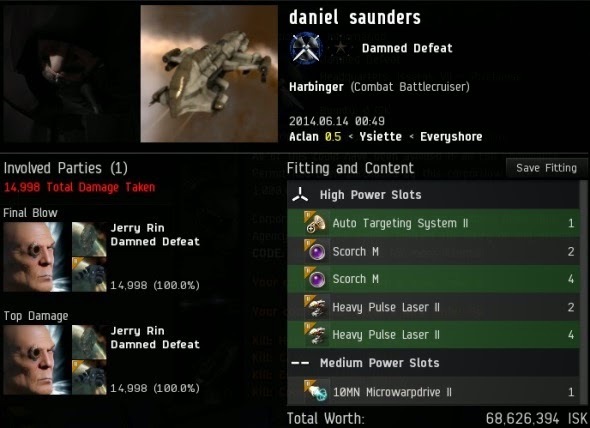 The audit was swift and its conclusions were devastating: Damned Defeat was filled with carebears who operated in highsec without regard for the Code. You could spend a whole day in the corp without hearing so much as a "praise James 315". Agents Jerry Rin and McRibwich vonBlueRibbon GuitarSolo did what they do best: They started blowing up their corpmates' ships. Mining vessels and their escorts were shot on sight. 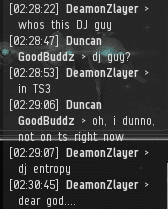 Highsec carebears go into a deep hibernation when they play EVE. It takes a loud explosion to wake them up. 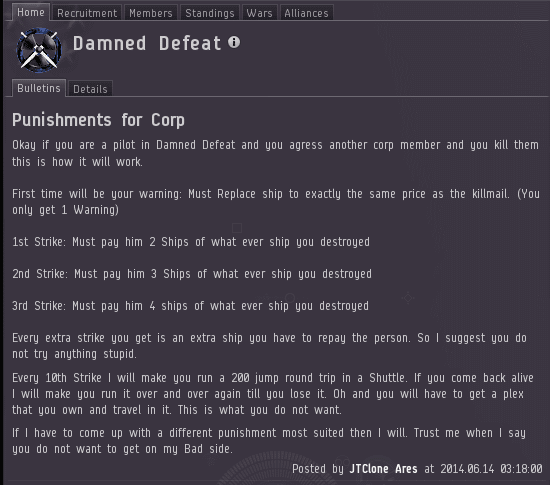 When the Damned Defeat line members noticed they were losing ships, they started actually paying attention to the game. The CEO took a very hard line on awoxing. He had almost no tolerance for it. If you awoxed the corp ten times (actually eleven if you include the warning), you would be forced to run a 200-system trip in a shuttle with a PLEX in it. That kind of punishment is enough to make anyone think twice about killing corpmates eleven times. The CEO was satisfied that the awoxers had been brought into line, so he went to a movie and told his newbies to earn some tax revenue. (Just another swell highsec corp for new players!) But here's the thing. Jerry Rin and McRibwich vonBlueRibbon GuitarSolo weren't just anybody. They were Agents of the New Order doing an audit for the New Order Spai Agency. No one tells them they can't enforce the Code. They would stick to their beliefs like superglue. Despite being aware of the active awoxers in corp, the carebears of Damned Defeat couldn't help themselves. Just a few hours later, they started a mining op, complete with Orca support. Our heroes refused to be constrained by JTClone Ares and his laws; they served a higher authority. But what would happen to them? Would they be forced to haul a PLEX in a shuttle around highsec? Or could they convince Damned Defeat to find absolution in the Code? 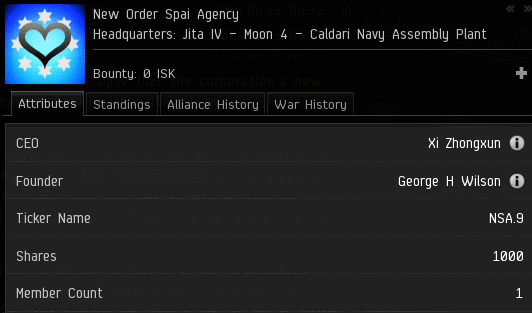 Only a billion isk to be left alone by the New Order awoxers? Sounds like a good deal actually. lol.... go to evewho.com and check out the links to the screen shots for this corporation's members page. JTClopne Ares - Title: "CODE war bride". Gotta love the work of CODE Agents - effective and with a great sense of humor while doing it! Come on guys, go for some irony here. If you're going to kill them and they're AFK anyways, why not use mining ships? I'd love to see an Orca blown up by a bunch of ventures. Feel free to mount your own Code enforcement AWOX in a manner of your chosing. I look forward to reading about it. "Mid sec" is not a thing. Everything 0.5 and above is highsec. Butthurt Miner could take a lesson on trolling from this post. Well played, anon @ 1:40, well played. I don't know how many details of this operation are actually going to be told in the follow up article, but of *all* the stories that have been published on minerbumping over the past two years, this one, at least from an "insider's perspective", is by far one of the most entertaining of them all. In the past we've read about some pretty silly people doing pretty silly things, but this little tale really takes the cake. I am *very* much looking forward to the future endeavors of the New Order Spai Agency. Yes but while some of us may know how this plays out, there is no better narrator than James 315. Erotica, knowing how it ends, makes the story even better! This was a wonderful day for the New Order and just a taste of what the New Order Spai Agency has in store for you. I had a great time playing a very small role assisting the hard work the brave Jerry Rin and the ever ethical and transparent McRibwich vonBlueRibbon GuitarSolo on this one - the voice comms were some of the most fun I have had in a long time. 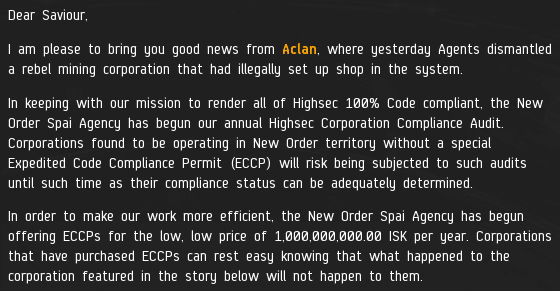 Non-Compliant corporations of New Eden - there has never been a better time to purchase a ECCP and shelter your corporation from a random New Order corporate compliance audit. Contact the New Order Spai agency today to get the paperwork started! What happened to their audit of you? Surely they only need to check your KB and API. Corp that trusting deserves to go down the tube. You can check our APIs and KBs to your hearts content. There is no way to guard against NSA corporation compliance audits. Sure there is. Obvious KB is obvious. They had it coming. I have been reading this blog regularly for the past few months and I must say, it is an endless source of amusement. I dropped in today to point out you imply the "rebels" are inept, yet take huge pride in every victory against them... It's one thing to beat up a crippled kid, it's another entirely to go bragging about it. I think your missing the level of hyperbole and satire in here. That corp bulletin nearly made me fall off my chair laughing.